Terrorist groups in Aleppo are using newly supplied foreign weapons in their counter-offensive against the Syrian army and its allies. Recently published online videos show Ahrar al-Sham, designated a terrorist organisation by multiple countries, carrying Turkish HAR-66 anti-tank rocket launchers – Turkey’s variant of the US made M72 LAW. On Thursday, militant groups including internationally-designated terrorist organisations, launched an offensive against the Syrian army an its allies in Aleppo. Mobile telecommunication and the internet connections stopped working since as militants gather in the south-west of the city. Earlier this month, a Free Syrian Army militant confirmed to the Reuters news agency that it had received grad rocket artillery in “excellent quantities”. According to the report, foreign states at a Turkey-based, US-backed coordination center have approved and facilitated the transfer of the BM-21 missile systems. The 122mm unguided rockets are fitted with a high explosive fragmentation warhead, and have a range of between 22km and 40km. Foreign-backed militant groups, including Ahrar Al-Sham which the United States supports, have increased shelling and rocket fire on the city in recent days. Special corridors designated for the safe passage of civilians and surrendering militants have also been targeted according to British, Russian and local reporters. The LAW (Light Anti-Tank Weapon) is a portable, one-shot anti-tank launcher still being used by the US military. Its Turkish variant, the HAR-66, is a copy of the weapon with upgraded safety features. 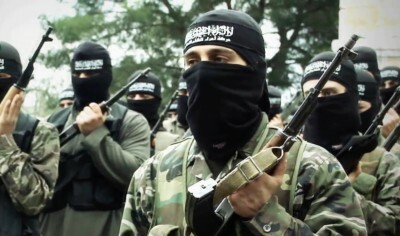 Syria, the United Arab Emirates, Russia, Iran and Egypt have all designated Ahrar al-Sham as a terrorist organisation – however, the United States, Britain and others have so far not considered designating the group as such. In May 2016, the U.S., Britain, France, and Ukraine blocked a Russian proposal to the United Nations to blacklist Ahrar al-Sham as a terrorist group.